Taking into consideration years of experience in catering for specialised needs of professional athletes, as well as specific conditionings of Poland and Slovakia let me present you with an offer of training camps in the towns of Zakopane, Wisła and Szczyrk in Poland and St. Pleso in Slovakia. In our undertakings, we shall put most emphasis not only on providing relevant accommodation facilities, but most of all on securing smooth arrangements for training schedules and sporting venues, taking the burden away from the coaches and team captains as organisers. We shall also provide you with a varied offer of extra activities, both physical and team building, available on request and taking into consideration needs and requirements of specific disciplines as well as training groups. We shall not provide any specific prices at this points, as packages can be arranged on teams' request and according to their needs. These can vary from 20 Euro pp FB in a simple BB/pension up to all inclusive packages in sports centres and 3-5* hotels. As mentioned earlier on, we shall not provide any detailed offer at this point as the choice is almost unlimited. Possibilities vary from anything as cheap as 20 Euro per person a nigh full board, up to all inclusive packages at sport centres and 3-5* hotels. Transportation from/to airports, and for local transfers can also be arranged on request. Both Sport Hotels in Zakopane and Szczyrk, as well as numerous hotels in all of the mentioned resorts dispose of excellent SPA centres and fitness facilities. These offer wide and varied range of specialised services (massages, water treatment, laser, ultrasound, magnetic or cryo therapy etc.) helpful in the training and regeneration processes. We have just finished a great week in Poland, and we are very grateful for all your help with booking. We got a lot of jumping in Szczyrk and had one day in Zakopane. A few of us had one day in Wisla too. We will not hesitate to recommend this tour to other jumpers. Our team is called Hedmarkhopp. Hedmark is the name of a county in eastern Norway, and our team has members from several clubs in this region. Attached you 'll find a picture of our team. 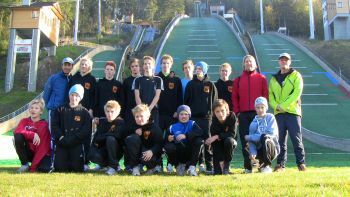 In front from left: Oscar Hafslund (2. place in Comp. K70), Vegard Tiller, Lars Afseth (3rd place i K70 Comp), Martin Lunna, Sivert Aaseth, Kristian Bessen, Audun Markeng. Thank you very much for all help during this process. We will come back next year! Es war sehr schön im Zakopane und für athleten sehr gute möglichkeit! Now everybody is ready on the plane. We have had a wonderful week in Poland. Perfect hills, hotel and transportation. Give a big hand to everyone. And thanks a lot to you for the help and organising. We already talk about next year. Merci Wisla pour ce formidable séjour. L'ambiance était top, la compétition était top, l'organisation était top, l'hôtel et son personnel étaient top. Wonderful travel to South Poland. Great Week with amazing polish fans et great organisation. équipe très professionnelle et sympathique ! ..... we would be lost without you. Gratulation for the good SGP, I got very nice feedbacks. with this email I would kindly like to say „Thank You" for your support during the Ski Jumping Summer Grand Prix in Wisla. From my point of view, the first Grand Prix in Wisla was organized very well and you as well as your team has done a great job! Again many thanks and kind regards from Cologne! Congratulations with a fantastic weekend in Wisla.... Good work..
First of all let me congratulate you for your new assignment! It is great to hear that. That give me confidence that this new organiser is in good hands :-) ! Special thanks to race secretary - Aga Baczkowska, she worked all the time more than 100%! Once again, thanks for a very good co-operation ! ... I'm very happy to work at least a little with you together. It was always a great plessure!!!! For me, you kept the ball rolling in Zakopane. Thank you, I keep very good memory of you. Thank You for all your help and your positive way of handling all questions. You helped us so much! Thank you for taking such a good care of our boys!! I have known that they are in good hands when they come to Zakopane. ... I want to thank you all for a very pleasant stay in Zakopane. I am very grateful for being there and I have very good memories after being together with good ski friends. ... and thank you one more time for the good cooperation during the Junior World Championships.